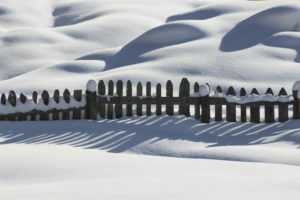 Winter can be a tough time for your fence! Is your fence ready for the first snow of the season? With snow in the forecast over the weekend, you don’t have much time to prepare for it if you haven’t already been taking steps. Let’s take a closer look at how winter weather affects the condition of your fence and what you can do to ensure it survives until spring. Water damage: Whether it is from rain or snow, at some point, your fence will suffer moisture damage. A wooden fence will be more likely to suffer this type of damage, so keep that in mind. Using a stain or a sealant of some kind can help prevent water damage. Soil erosion: Soil erosion, as we’ve noted before, can do awful things to your fence. Do your best to protect it, especially if you are concerned about sinkholes or other consequences of erosion. Unstable temperature: As it gets warmer and then colder again, wood fences will feel it. In fact, they might start developing holes that can allow mold, mildew and other sorts of decay to move in along with convenient homes for termites and other pests. Have you recently applied a fresh coat of stain for your fence? If you have, then you’re in good shape. Even so, you shouldn’t stop there. What else can you do? Examine your fence: Examine your fence for any signs of damage after the latest storm. How stable a fence is can be easily determined Take a piece of string and stretch it out along your fence posts. If you notice that the fence posts are leaning when they shouldn’t be, it could be a sign it’s time to replace them. Remove leaves: Don’t forget to remove leaves and other bits and pieces from your fence. They might get stuck in the gaps between your fence boards. Signs of Damage: If any of your fence boards show signs of damage, don’t hesitate to replace them. This entry was posted on Friday, December 8th, 2017 at 10:39 am. Both comments and pings are currently closed.